The state wholesaler State Trading Organization (STO) has cautioned against panic-buying of fuel as hundreds continue queuing up at petrol stations for a third day. “There is absolutely no shortage. We are operating out petrol stations at normal hours, but only rationing petrol because some people are buying petrol in bulk,” an STO media official told Minivan News. Malé’s waterfront is congested with cars, trucks and motor cycles on Boduthakurufaanu Magu where the two main fuel stations are located. Many people in the queues said they had heard STO is running out of petrol. Today’s queues are shorter than Wednesday’s. 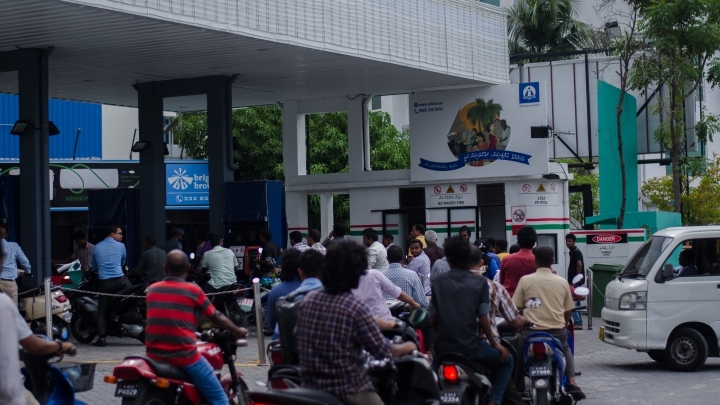 STO’s petrol stations – managed by subsidiary company Fuel Services Maldives – on Wednesday started rationing fuel, only providing each vehicle with five liters of petrol. “Why else would they ration the petrol? Look at the big queue here. People would not panic so much unless there is a problem. Of course there is shortage,” said Shathir Ahmed, 21 years. Some people said they had waited in queues for between an hour to two hours on Wednesday. The waiting time was approximately 20-30 minutes today. STO said panic buying had been triggered by media reports of shortages. “We appeal to the public to confirm with us if there is a shortage before stocking up,” the media official said. Online newspaper CNM reported today that STO is suffering from a shortage because the petrol delivery ship was delayed due to bad weather, and is due to arrive on July 27. However, several people at the queues continue to carry large bottles and tanks to stock up. “I am collecting as much petrol as I can. I have already gone to the other two station and gotten 10 liters of petrol. If we run out, it would make life very difficult,” said a middle-aged man, back at the queues to get his 15th liter.